BoardGaming.com> Games> Card Games> Bang! The Bullet! Under the burning High Noon sun, unexpected events send the gunmen scurrying for cover in a ghost town. While in the bison town of Dodge City, new gunmen compete with the old, using new tricks and unknown techniques. When the going gets tough, the tough put it all on the line, putting up A Fistful of Cards and going for broke. If that weren’t enough, even stranger gunmen emerge from their secret hideouts! Now the Sheriff has decided to settle things once and for all in his own way. He has written a name on a single bullet. That name is... BANG! Bang! is an awesome party game that will be brought out many times even with the same group. The randomness of it leads to a bunch of variety and it’s easy to role play without feeling lame. Any game with backstabbing is a personal favorite, and this one encourages it! Setup is really quick: Deal out 2 types of cards, the character and the role cards. Then deal a starting hand and let the game begin! The Sheriff and his Deputies must kill everyone else (the Outlaws and Renegades). The Outlaws must kill the Sheriff. The Renegade must be the last man standing. 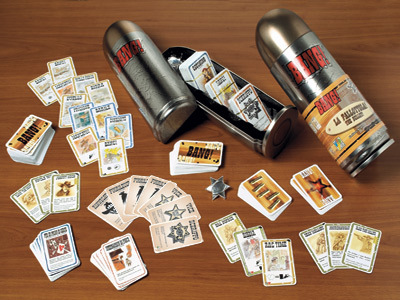 The players take turns, each drawing cards and shooting others (Bang!ing them) in their attempt to bluff or actually achieve objectives (part of the fun of the game is pretending to be something you’re not in order to protect or kill the Sheriff). Once a group or individual satisfies their win condition, the game ends. This is not a serious game by any means – it’s meant to be played at a BBQ or family event. This game is at its best when everyone is lying and backstabbing. Some groups have a hard time being able to bluff or role play and this can make the game a bit lackluster. Bang! The game of wild west shootouts and innuendo! Bang! is a card game created for 3 to 8 players representing good guys, bad guys, the drifter and all the entertaining tropes of the Spaghetti Western Wild West! The good guys are comprised of the Sheriff and his deputies. The bad guys are the Outlaws. The drifter is the Renegade! The good guys need to mow down anyone without a tin star, no need for Miranda rights in this town. The bad guys have one simple mission, lay waste to the chief law dog, the sheriff! Doesn’t even matter if the deputies are still standing, as long as the sheriff dies of lead poisoning, victory! Oh and they don’t even have to all be alive! Even if, let’s say, one Ike Clanton is the only outlaw left standing after Wyatt finally drops, the whole Cowboy clan wins the day… so to speak. 🙂 As for the Renegade, he rides a motorcycle in a cheesy 90’s action show, no wait, that’s not right! The Renegade is the turn coat, his mission is to literally be the last man standing, so he will help the sheriff right up until it’s him and the sheriff left and then it’s time to turn them smoke wagons on the badge! Each player selects one of a cast of colorful characters who possesses a special ability, like stealing cards from the person who shoots you or being able to play any card to dodge a bullet, and if the ability happens to be a little stronger than the others, that character’s health is one tick lower as a balancer. The game set up is rather interesting since your seating arrangement actually matters for the game. The range of your firearms is measured by the number of people on your right and left. You then get dealt cards from a draw deck and use those cards to inflict wounds, dodge bullets, drink beer and survive Indian raids. The namesake of the game, and the chief way to “shoot” someone, is via the Bang! card, which is basically a shot fired! Once you’ve run out of health (tracked with bullet markers), you’re pushing daisies! As for the components, the card art is fantastic and has a nice style to it. The bullet markers are just card board cut outs but they do the job nicely. (See my game tip for added immersion 🙂 ) The only thing I might take a point or two away for is some of the rules for specific cards are poorly worded, which can get a little confusing. However, there is great support on the game website as well as fan blogs, so the clarifications are a few clicks away. Bang! is a really fun party game if you’re a fan of cowboys, Clint Eastwood, Doc Holliday, spaghetti western films or games that are fun to play with friends and family. I highly recommend this shoot out at the dinning room table! Bang is a pretty stellar game. I was introduced to it about a year ago, and followed up with the iPad version, which is fun, but, like all electronic games lacks a human elements. Recently, I acquired Bang! The Bullet! Edition, which comes with the High Noon, Fistful of Cards and Dodge City expansions. 5/5 Replay Value: The different combinations of seating arrangements, character choices (especially with the expansions), and roles give this game almost endless possibilities. As a veteran of the game, I still get as much enjoyment out of the game as the people I’m introducing the game to. The base game has less replay value than with the expansions as the card choices are somewhat limited. On the other hand, the base game is the easiest way to introduce new players to the franchise. 3/5 Components: The cards are well made, with artwork even I can appreciate. The actual Bullet box, however, although it looks nice, is rather inconvenient as it doesn’t store well with other more conventional game boxes, and the top and bottom don’t hold together all that well. The slots to store the cards in are somewhat inconvenient as well, as they are difficult to line the cards up with. The slots are also weird sizes, but do store all the cards. What would have been better, slots made the size of (1) the base deck (2) Dodge City expansion (3) High Noon/Fistful of Cards decks, and maybe (4) Character cards. Since this is not the case, cards get mixed up easily and take a while to re-organize. 4/5 Easy to Learn: The game is simple enough with a well balanced and intuitive set of rules. The one issue is that all the cards are explained with the use of diagrams which are not so easy for new players. Additionally, specific card effects/rules are not further explained in the rule book, which would be useful since player interpretations of certain card effects sometimes differ. Overall this game is awesome, and deserves an 8 or 9/10. It scales well from 4-8 players. I have yet to play the modified 3 player version. As a result, it makes for a great party game, although it requires everyones focus (to figure out opponents roles), so it may not be best certain groups. Hold on there pardner! Bang! The Bullet! is actually a collectors set – being comprised of the original Bang! game, the first expansion: Dodge City, the second expansion: High Noon, and the third: A Fistful of Cards. So if you want to try Bang! you dont necessarily have to purchase the Bang! The Bullet! set as it retails for around…$35.00 But you can try the game For around $15-$20. ( or less if you know someone with a copy!) The game is better with expansions however. Bang! is a card game – so beyond the artwork on the cards, there is not much to say except that the artwork is gritty, stylized and has a modest “western” feel – reminding one of an old western wanted poster. The “Bullet” that stores the deluxe edition is very cool. I have a hard time fitting it on my game shelf with all the other square games in there – but maybe that’s the point. Anyway, the components are not the main attraction of the game, but its not a detraction either. In the game set-up each player gets dealt a secret “role.” The roles are: Sheriff, Deputy, Outlaw and Renegade. Each players objective depends on their role. The Sheriff and Deputy need to “eliminate” the Outlaws and Renegade. The Outlaws want to eliminate the Sheriff and Deputy. The Renegade wants to eliminate everyone else! When the players are dealt roles – only the player with the Sheriff reveals their identity. Everyone else keep theirs secret. So cool – immediately we have objectives with no clear path to achieving them. Next, each player is dealt (or chooses) a character from a semi-fictional old west. Each has a name and a special ability that they can use during the game. Each also has a number of “bullets.” (Hit points or life total if you will). So thats the setup.. And as the name suggest – the object of the game is to … well.. shoot each other. But who do you shoot – and how do you shoot them without revealing your identity? A game turn is simple: players draw 2 cards, play a card and just try to survive. Easy to play, difficult to find your targets if your the Sheriff and difficult to keep your identity hidden if you are anyone else. There are weapons cards to increase your damage, “Beer” cards ( which ironically heal your character) and other fun devices of the time period. The game includes a unique random element as well – Each card has a poker symbol in the lower left corner. Some cards require a “draw” – to check and see if their effect is successful. In this case a player has to draw the top card of the draw pile and match it to the required poker symbol. One slightly daunting thing about the rules is the use of symbols on the cards. There is a symbol for every unique gameplay action. And the game provides a reference card but it takes a few games to get them down pat. And there are some special cards that have more complicated effects – and you will have to reference these rules as well – but they are worth it. I think $20 is high for a card game. The game play is fun enough and replay value is great. But.. there are less expensive game card games. If you are buying the “Bullet” you get so much more for your money. Depends on your budget. I can’t automatically recommend this game as a family game. It depends on the family. I have kids. And we all love to play games together. This game is a tough call – especially nowadays. For some, the blatant title that may be reason enough not to play this game with children. (the game says 10 and up). However, some may see all this bloodshed and violence easily acceptable since it is cloaked in the “old west” theme. I’ll leave this to your personal preferences. Bang! Is best played with more than 4 people. Maybe that’s why a lot of folks consider it a “party game.” (and as such feel free to wear western hats and have a lot of jerky on hand) But because of the variables during set-up, 4 or less players is still enjoyable, but less so. The card symbols make the game playable by younger kids but again – see the disclaimer above. It’s important to know that these components are NOT included with this version. Instead of using bullet markers, you use a card with bullets on it that you slide up or down. Furthermore there’s no board to organize your play area so you just do this the best way you can. At first I missed the components from the original, however having a single package for all of the expansions is worth it, and the game doesn’t really suffer from missing the extra components. -Fun theme and concept that appeals to most players. Who doesn’t appreciate a spaghetti western? -Symbols can be a little vague and ambiguous. Reference cards are missing some symbols. This is a really fun party game, and this specific version is a good one. Sticking with the basic version is probably fine, however I highly recommend you add this game to your collection. Bang! is a fun party style card game. It’s fast, fairly easy to learn, and the games seem to last a pretty good amount of time. Not to long, not to short. Everyone is given a secret role to play. You might be an outlaw trying to kill off the sheriff or you might be the deputy trying to assist the sheriff. The other players don’t know who you are, but it becomes pretty easy to figure out pretty early into the game most times. This isn’t necessarily a bad thing though. The way you play the game is draw cards. The cards represent actions or items. One action is Bang! and allows you to shoot another player within your shooting range. Everyone will start with a default range of one person over from them, but might be modifiers to allow them to shoot further. You can also get items such as guns that allow you to shoot more people at once or further. You may also get items such as beers that will regain health. There are many more items and action cards in the game. Most of it is pretty easy to understand and easy to use. -Not a ton of strategy. I like Bang! and do want to play it again. A few games go by pretty quick, but that is really all you need. It’s fast action, has a little strategy to keep things interesting, but isn’t a deep enough game to devote tons of time into, but this isn’t always needed. Pick up Bang! for a fun game that a few people can play easily with little to no rejection, but keep something else on hand to fill in the rest of the time. Bang is one of those games, in my opinion, that is easy to play for pretty much anybody, but can offer hour after hour of solid entertainment. In this game, players will select roles at random. Each role has a different victory objective. The one role that everybody will be able to see is who the Sheriff is. The Sheriff (and the Deputy) win by killing the two Outlaws and then the Renegade. The Outlaws will win if the Sheriff dies. The Renegade will win if the Outlaws die and then the Sheriff. However, since nobody knows who the others are – it becomes a guessing game as to who is who. Are you shooting your friend or your enemy? Because of this, the game requires a little bit of deductive reasoning and observation skills to try and figure out who is who. Gameplay wise, its fairly simple. The cards are pretty straight forward, and the interaction of everything is pretty good on the whole. It may not be something that can provide a gamer who is in for intense strategic thinking a good outlet for their tastes, but if you are looking for a game that is easy to pick up and play as well as lots of fun, then I’d recommend Bang! Its also a fairly good gateway game, getting people who may not be otherwise interested in board or card games to be involved with the hobby. Very intriguing trying to guess what everybody’s roles are in the game and fun to shoot your friends. I recommend this game for all gamer types. For Strategy gamers, this game has limits. Depending on the experience of other players, you can easily figure out who is which role within the first 2 rounds, as Outlaws all shoot the Sheriff, and Deputies then react by shooting those who shot the Sheriff. I always feel sorry for the Renegade, because it is very hard to win with that role… So if you do happen to draw the Renegade, all you can do is cause havoc by helping the Deputies kill the Outlaws, while waiting to pounce on them and then the Sheriff at the end. Renegade though, usually is the last 3 people alive, which is a redeeming attribute. But it manages to redeem itself by the human interaction and manipulation which you can use to cause reasonable doubt for other players. ***If you like to spice up your games, It doesn’t mention in the rules, but you can add in a new Trading rule that I like to use. With this rule, you can only offer to trade the BLUE cards out on the field, which are considered the “Equipment” cards in the game. You can only trade during your turn, or if it is the turn of the person you are trading with. Now keep in mind, with this Trading, you can have aces up your sleeve like a “Cat Balou” card, which allows you to steal any card that a player owns, or choose a random card from their hand. Which used after a trade, would really put that other player at an advantage, so trade wisely! The first time my family played this, we made the critical error of assigning roles randomly. DON’T ever do this. Pick the person that everyone will love to gang up on to be the Sheriff, at least the first time, because everyone will be gunning for them. You need to be thick skinned and willing to laugh it off, when all the other players are out to get you. Other than that, the game is about the right level of complexity both for families and serious gamers, as the theme encourages some light hearted role play and the mechanics serve the “story” rather than getting in the way. However, a rules champion is needed to ensure fast game play, so that the game is quick. The main reason being that if (when!) you are eliminated, purely because you are in the way of a neighbours goal, you are out of the action for a while. Making this an entertaining spectator sport is a necessity, unless you use some of the unofficial expansions available that allow dead players to come back as ghosts. Bang is a fun party game, it plays better with more people. The cards are good looking and the art is simple but effective. Gameplay wise I think Bang suffers from a couple of flaws (at least one of which is partially solved by this expansion heavy edition). It can be easy to be killed early on in the game, at which point you are out and have to sit and wait for the next game. And this game can go on for a long time once you get down to 2 people. Not ideal. The expansions add in ways to shorten the game, which does help somewhat. Overall, its a fun game but not one I will pull out that often. How many western board games are there? This is a fun game with a lot of replay value. Everyone wants to be sherrif so they can wear the badge. For some reason, the sherrif usually gets brain-panned by his/her deputy. Some great flair, funny, fun, and exciting. Adults love to sit around and say “I’ll bang so-and-so.” The more you give, the more you get from this game. Fun. Simple. Some of the characters are markedly cooler than others. I ran a gaming club for ~4 years and this game was a favorite of everyone from the very begin. It never got old, and it really helped break the ice for new people and kept them coming back for more. It’s fairly easy to pick up the rules. And you can add more complex game play with the expansion decks that come with it in the bullet version. A game where everyone is a secret character and has different win conditions/motivations. You end up spending more time just trying to stay alive and kill people randomly than actually trying to figure out what character they are. Fun and fairly fast, though very difficult to win depending on your character. I enjoyed the reach system, and how gameplay changes as people are eliminated. However, this also can leave people out if killed early, which is not particularly fun. I like Bang a lot. It’s like mafia, but with structure. Love the theme, too. I actually wrote a whole long review for this game at http://www.facadegames.com ! One of the best parts of the game are the different character cards. It’s fun having your own “super power”, and to play to your strengths to win. I also like the deception aspect – never really knowing who is on your team. The best games are the ones where it’s really hard to figure out who people are. Super fun game. I love being the deputy and confusing everyone. This is a game based on Game Theory, but even if you take that aside and just play it for what it is, its fantastic. Easy to learn comes with its own little legend to understand the symbols on the cards and after playing it once, you usually know all there is to know. The theme of this game is constant and you feel like an old cowboy or girl when going up against the assembled sheriff, deputy, outlaws, and renegade of the town. Add a Review for "Bang! The Bullet!"